Native to North America, Virginian skullcap was once known as "mad dog herb due" to an erroneous belief that it could cure rabies. Today it is mainly used as a sedative. Its European relative, marsh, or hooded, skullcap (Scutellaria galericulata) has similar properties, while the root of the Chinese species (Scutellaria baicalensis), known as huang qin, is used in hot, feverish conditions. 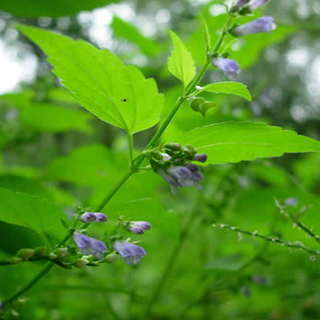 Skullcap is a nervine tonic, sedative and antispasmodic. The herb is useful in treating nervous agitation, hysteria, anxiety, insomnia, nerve pain and tremors. Drink 1 cup (1–2 tsp dry herb per cup of boiling water) 3 times daily for nervous exhaustion, excitability, anxiety, or stress. In cases of insomnia, drink 1 cup (1–2 tsp herb per cup of boiling water) before bedtime for a soothing tea to ease tensions at the end of the working day or to ease emotional upsets associated with premenstrual syndrome. Take 20–40 drops (1–2ml) in a little water 3 times daily for nervous tension, stress, anxiety, or associated headaches. Commercially available, and often combining skullcap with passionflower. Follow dosage directions on the package and use for anxiety and stress. Prefers moist but well-drained soil in sun or partial shade. Sow seeds in autumn or spring in seed trays and transplant to 3in (7.5cm) pots when large enough to handle. Grow until well established before planting in their final positions. Alternatively, divide plants in spring. Self-seeds enthusiastically and can become invasive. Cut while flowering and dry immediately; the aerial parts will contain both flowers and seed pods.